Wooden Blinds. UK Online orders from Bay Blinds Limited. Our original best selling wood Venetian blind using 25mm slats mounted onto a durable metal head rail. Available in Natural, Teak, Rosewood, and Forest Green finishes. Our original wood slat Venetian blinds available in two slat sizes, with a drop of 160cm. 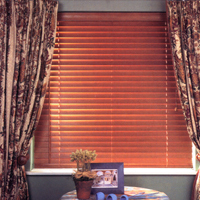 Blinds can be cut down by up to 75mm each side.